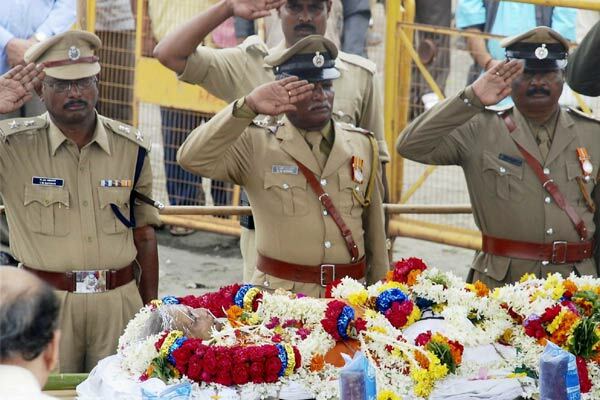 Funeral of the late vocalist Gangubai Hangal being performed with state honour in Hubli. 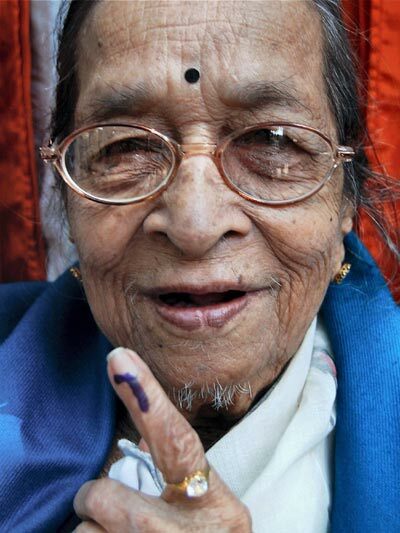 Vocalist Gangubai Hangal shows her marked finger after casting her vote in Hubli. 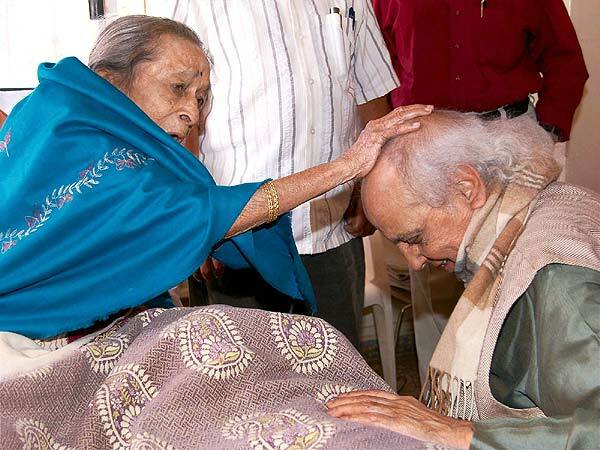 Veteran classical musician Dr Gangubai Hangal blesses Hindustani vocal maestro Pandit Jasraj during his visit to Dharwad to receive Dr. Mallikarjun Mansoor Award. And, may we add, in the soul. Here, every morning, the young and the old sip their brew at the local tea shop, as ragas flit gently out from the radio playing in the background. The guru-shishya bond has not become a quaint fossil in Dharwad. Youngsters know how to tell their Hansadhwani from their Durbari and learn music with single-minded rigour. At every corner, history binds Dharwad to melody. Officials at the All India Radio station here, for instance, recall how in 1950, when AIR opened a station, the inaugural song, Vande Mataram, was sung by Pandit Bhimsen, Gangubai, Mallikarjun Mansur and Basavaraj Rajguru. Even today, the station broadcasts Hindustani classical music three times a day. History also helps explain the dominance of Hindustani classical music over Carnatic in this region of Karnataka. Royal musicians from the Mughal court at Agra and the seat of the Scindias at Gwalior were regularly invited by the Maharajas of Mysore to perform in their court. 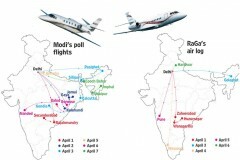 On their way, they would halt at Dharwad and perform at impromptu concerts. Ustad Abdul Karim Khan was one such frequent visitor, who would stay with his brother in Dharwad. There he taught his most famous disciple, Sawai Gandharva, the legend who was guru to Gangubai Hangal, Bhimsen Joshi and Basavaraj Rajguru. Unlike the countless admirers who flocked around Hirabai and Kesarbai, Gangubai lived with a liberal-minded husband, Gururao Kaulgi, a Brahmin lawyer, with whom she had three children. But instead of basking in the success of her marriage, she persuaded Kaulgi to take another upper-caste wife, feeling that it would be the proper thing for a man of his stature. 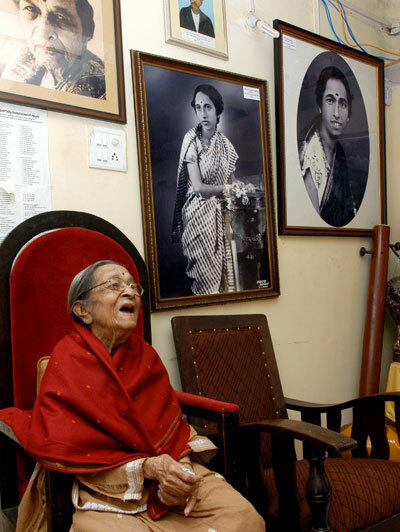 Perhaps the singer who came closest to Gangubai’s temperament was the self-effacing and supremely gifted Mogubai Kurdikar, mother of Kishori Amonkar. It is not surprising that Gangubai and Mogubai became close friends, and even less surprising that they spent more time exchanging notes on their culinary, rather than musical, knowledge when they met. 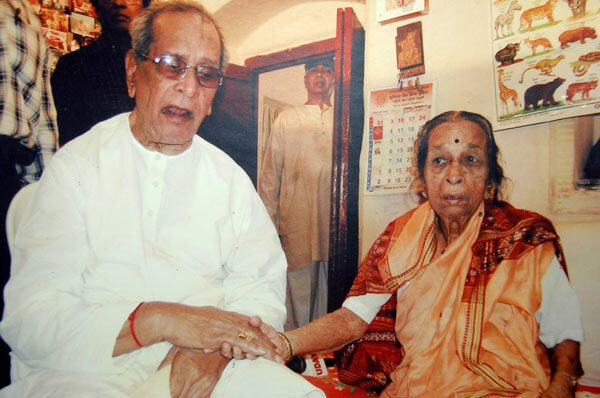 When Bhimsen Joshi was awarded Bharat Ratna, his guru-bahan, Gangubai Hangal, was deeply nostalgic about the intense training the two received in Kundgol under Sawai Gandharva, and recalled how her Bhimanna would carry a lantern as he accompanied her to the local railway station every night when she headed back home to Hubli. 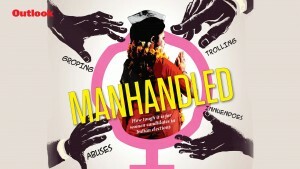 She also recalled Bhimsen's 'gandabandhan', an event where the guru accepts you as his disciple in public. "It happened at the Hubli Railway Institute and our guru Sawai Gandharva tied threads of five colours on his wrist. This was around 1948-49. As an elder sister I feel very proud about my brother being called a Bharat Ratna." As a schoolgirl, she sang the welcome song at the only Congress session Mahatma Gandhi presided over. In her teens, her music was recorded by HMV. 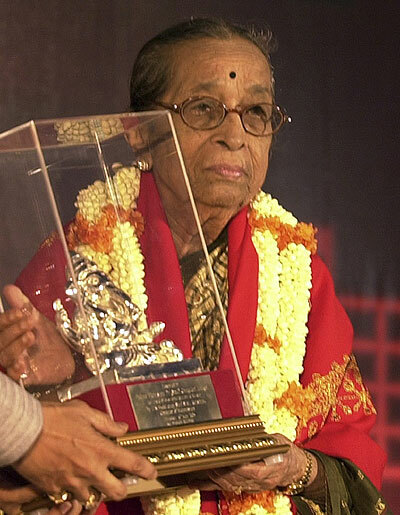 In 1936, she sang on All India Radio for the first time as a stand-in for Hirabai Barodekar. Thus began Gangubai Hangal’s journey on the road to musical greatness. Padma Vibhushan, haven’t gone to her head. She makes no bones about the fact that she has to earn in order to feed a large family. My family name was Gandhari Hangal, but the recording company rechristened me Gangubai Hublikar, because my native place, Hangal, was a small town compared to Hubli, which has been a leading centre of trade and commerce. I was told by the bosses that the change would bring me wider fame. That was not all. One of the company bosses had second thoughts, as a result of which my original name (Gandhari) came to be printed on some of the records instead of Gangubai, as it was considered too common a name. This jumbling of names continued for some time, till I came to be known by my present name. "I was born in Shukravaradapete in Dharwad. It was a Brahmins' colony and those were conservative times," she says. It was forbidden to enter Brahmin thresholds. Gangubai remembers how, as a little girl, she went into the neighbour's garden and was caught stealing mangoes. They were aghast at the impunity of a singer's daughter. "Ironically, the very same people now invite me to their houses and spread a lavish lunch for me." 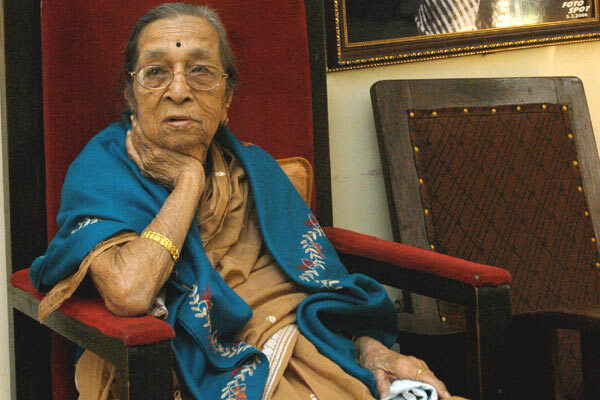 Gangubai recalls how HMV would rent a house, cook and all. It was a long process—wax records had to be made and dried before a song could be recorded. Once, she reminisces, she had decided to take the evening train to Hubli after a particularly long session when she found a man from HMV waiting for her at the station. The records had broken, he told her, and the recording had to be done all over again. cloud around me." Not for long. As she made her name—she says the record companies helped a lot—her life fell into place. "Before the '50s, I had a soft voice. Then I had tonsilitis. I used to be in great pain. A doctor treated me for it with electric shocks. The pain went, but my voice changed. I didn't mind it at all." [Ambabai] was so brilliant that the best of musicians came to listen to her. Abdul Karim Khan, the forerunner of the Kirana gharana, would often drop in to listen to Ambabai. 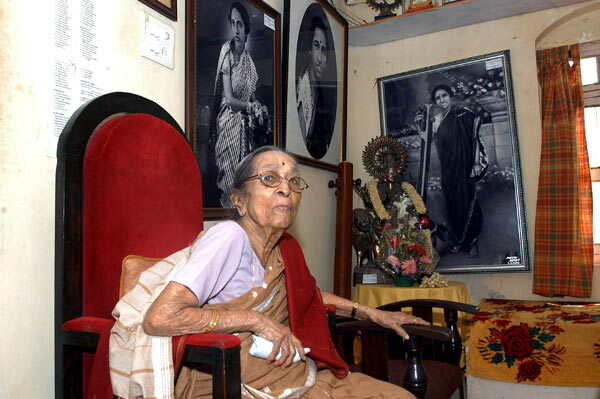 In fact, Gangubai remembers how on one occasion he had remarked: "I feel I am in Tanjore." Ambabai tried to train the little Gangu in Carnatic music, but realised that her heart was elsewhere. On her way back from the National School (she repeats the name of her school several times with great pride) Gangubai would stop by to listen to the gramophone played at almost all the petty shops in Kamanakatte. "They had a huge horn, you know," says a wide-eyed Gangubai. "I can't remember who the singer was, but it was `Radhe bolo mujhse'." Gangubai kept humming these tunes throughout the day, all the time. "You are not intelligent enough to keep the two systems separate. So you learn Hindustani," he mother said. How could there be unification of the two paramparas? I simply can't imagine such a blend. The two systems have enjoyed a peaceful co-existence without shedding their basic character and identity. Shouldn't we leave them alone to grow and prosper on their own? It is normally announced to the D.C. (District Collector) here. Then they come to ask to check who the person is, whether they want to receive the award or not.... They came and took my signature from the Tehsildar's office. After they took it, I thought, 'These are announced on January 26th, maybe on the 25th night. I must listen to the radio before I sleep. Both of us must sit together before the radio, listen to the announcement and then sleep'. We sat for a long time. Nothing was announced. So I said, "Look, they asked me for my signature just like that. It's not there. Nothing has come." It did not occur to me that nobody's name was announced. Mine didn't come, this is all I thought. Q: Mother didn't see it...you thought that? Gangubai: Yes. My grandmother didn't see, my householder(*) didn't see (*The word 'husband' does not exist in Kannada. A term commonly used is ejamanaru which means 'Master'). All this came to my mind. It was 4:00 or 4:30 in the morning. Then the paper came. There used to be a newspaperman who used to come here. Someone known to us went and got the paper- "Wake up, wake up, you have got the Padma Bhushan!" As soon as he said that, again everyone who was not here came to mind.